Do you work at Rasa? What did you think of Rasa? Rasa is a great little restaurant - perfect food and even better service. Rasa N16 certainly gets my vote. The food is very good. But if you leave anything behind don't expect to get it back. Today having eaten lunch there l stupidly left an unopened birthday card on the table and got suspicious when the staff denied finding it. Apparently it contained £50 for my 65th birthday present from my children. Rasa N16, the first of the Rasa family of restaurants, is a colourful Keralan favourite with light, original and utterly delicious vegetarian fare. This small restaurant, halfway up Church St, is a favourite with locals and one of the few places in the area that brings outsiders into Stoke Newington, the neighbourhood that public transport forgot. Blushing hot pink and gold, inside and out, Rasa stands out from its neighbours. Comfortable padded chairs and low lighting make the most of the compact interior. 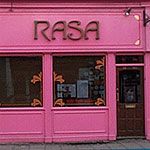 Always busy, even on a the dreariest of Tuesday nights, and packed on weekends, Rasa has a low key but satisfied buzz about it; it is almost as if the pink glow from the paint work is enhanced by the contentment and happiness of the diners. Subtle music keeps table conversations private and the friendly, efficient staff are always there to answer questions about the menu to new customers. The food is the star of the show at Rasa with dish after dish of authentic, good value fare cooked with a light touch and attention to detail. The cuisine is Keralan, vegetarian food from south west India. Banana Bolis, crisp plantain morsels, teeter deliciously between sweet and savoury, and are always a hit. At £2.75 they are around average price for a starter. The creamy, dreamy aubergine main, Bagar Baigan, and Cheera Curry with squidgy cubes of paneer in spinach are both under £4. Mix these with tangy lemon or nutty tamarind rice and a chapati or paratha, and a meal at Rasa becomes a feast. Rasa is not the place to come for a traditional Korma or Vindaloo and diners will have to have travelled widely – or be Keralan - to recognise any of the dishes on the menu. The spices are used to build up subtle flavour in each dish, rather than fire the palate; there are no flushed-faced grabs for the raita here. Indian visitors to London come to Rasa and say it is the best Keralan food to be found outside Kerala. Understated wine list and the usual Cobra or Kingfisher beer in huge bottles provide lubrication for the luscious food. The fruity mango lassi, served in metal cups, is also worth a try. One of the best Indian restaurants in London.